It’s only appropriate that the inaugural smoothie recipe I post is one of my favorites. There are a myriad of health benefits attributed to blueberries, including but limited to, antioxidant powerhouse, brain food, anti-aging, anti-cancer, and eyesight improver. Living in Michigan, one of the top blueberry producing states, I buy them by the pound when in season and freeze a fair amount for future use. Most grocery and health food stores carry frozen blueberries (get organic or wild when possible) ready for all your smoothie needs. Because they’re low in sugar and loaded with nutrition, berries are an ideal smoothie ingredient. You have to be careful with other sweet fruits that can quickly turn your smoothie into a sugar-bomb. Feel free to adjust the ingredients for a larger serving and/or upgrade the nutrition with an add-on or two. I encourage you to use the milk you prefer. When determining the nutritional information for this recipes I used my preferred milk – raw milk. A 1 cup serving contains 160 calories, 9 grams of protein, 9 grams of fat, and 12 grams of carbohydrate. Enjoy! Place all the ingredients into a high speed blender and blend on high for 30-45 seconds or until desired consistency is reached. 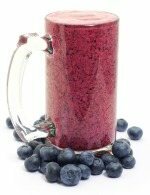 I would love to know if you try this blueberry blast smoothie – please leave a comment below. Happy Blending! Just started making smoothies and found your site, it’s been a great help, thank you. Tried this one and love it, has I have just started using cinnamon, I also added honey and a few cashews. I use coconut milk has I’m lactose intolerant. Is that ok? You’re welcome, Steph. Great to hear you’ve hopped on the healthy smoothie train :) Yes, you can use coconut milk in any recipe that calls for cows milk.